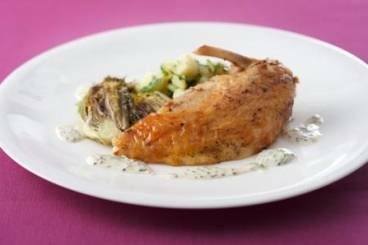 Discover our fantastic selection of guinea fowl recipes, all written by our expert chefs. These guinea fowl recipes are easy to cook and perfect for cooking time and again at home. In the same family as chicken and partridge, this small bird has a relatively strong game flavour. Older birds are perfect for use in a casserole as the juices from the dish help to keep the flesh of the guinea fowl moist. 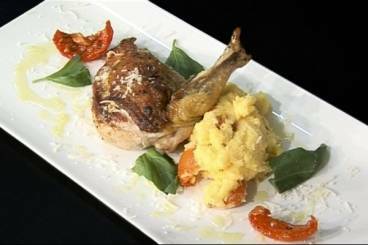 A breast of guinea fowl stuffed with mozzarella served with sauteed fennel, pine nuts and sun blushed tomatoes. Guinea fowl with a warm salad of butternut, watercress, pinenuts and parmesan. Guinea fowl supreme with a salad of apple, watercress and walnuts. Pan roasted guinea fowl served on a crisp salad of apple, watercress and toasted walnuts, finished with a chicken jus.